Congratulations, your baby is turning 1! This first birthday is a once-in-a-lifetime event and, as parents, we all want to make it a memorable one – but where to start? Here are some party-planning tips and advice to help you create a special – and stress-free – first birthday party. Create a photo garland. Use yarn and clothespins for a hanging display of monthly photos to show how much baby has changed over the year. You can also back the photos with colored paper, add numbers to show each month, etc. Frame "A Year of Firsts" with photos of your baby's most memorable “first” moments – like her first smile, first bath, the first time she sat up, first vacation, etc. Create a time capsule. Invite each family member to bring or send an item for the capsule that is meaningful to him or her – such as a photo; personal letters that share memories, wishes or fun predictions; newspaper clippings of events and trends of the child’s birth year; a popular product that year; etc. Ask them to include a note explaining why they chose it (to help the child put the item in context when the time capsule is eventually opened). Seal the items in a container – to be opened when your child is 18. Purchase a new matted frame to place your baby’s first birthday party photo in. At the party, ask guests to write a personal message or sign their name on the matte. Hang the picture in your baby’s room later. Another way to capture personal messages from your guests is to have a guest book or journal where they can write a message to your baby. Create fun party favors. Set up a photo-op area and snap a picture of your guests with the baby-of-honor on your digital camera. Simply print the pictures and slide them into a ready-made card frame before the party is over, and you’ve got a cool and memorable favor from your baby’s first birthday bash. Location: It’s often easiest to host baby’s birthday extravaganza in your own home – it’s where your baby will feel most comfortable and protected. However, if the weather is pleasant, outdoor parties in your own backyard or at your local park can be a huge hit (and make post-party cleanup a breeze). Time: Don’t expect too much from a 1 year old. The party shouldn’t last longer than a couple of hours, since baby burnout can come about quickly. Try to schedule the party after your child is rested and fed; that way, you won’t have a fussy partier on your hands and everyone will enjoy themselves – including you! The guest list: Stick with inviting family members and close friends to a first birthday get-together. While you should certainly invite anyone whose presence you’d enjoy, try not to go overboard with invitations. The smaller the crowd, the less overwhelmed baby (and you!) will be. Set up: Don’t be afraid to ask for help. A party is a lot of work, so ask a friend or family member to keep an eye on things and help the party run smoothly. Make sure that there’s plenty of seating for the adults and lots of crawling or toddling room for the babies. Setting up a baby-proof play area with stimulating toys is a great idea, since the babies can gather there to play and interact. Decorations: Whether you go all out with decorations or keep it simple, a splash of something special will make the setting especially festive. Choosing a theme makes it easier to shop for birthday decorations and brings a sense of harmony to the whole atmosphere. Balloons and streamers in your theme’s colors are inexpensive and will brighten any celebration. Use toys you may have as party decorations. For example, if you’re doing a jungle or circus theme, add several stuffed animals around the party room or use them for balloon weights. Decorations like garlands, letters to spell the child's name or O-N-E, pretty labels for food and water, etc., are also a big trend. TIP: If you want to decorate with balloons, opt for mylar balloons. Latex balloons are a choking hazard to kids under the age of 4. Food: You will be hosting for both children and adults, so it’s important to have the appropriate food for both groups. Finger foods are always a hit and are easy for moms to eat while on the chase. Go with easy nibbles like sandwiches cut into quarters, fruit and cheese trays, veggies and dip, rolled cold cuts, mini bagels and one-scoop salads. The key is to plan a menu with food that keeps well over a period of time and that can be prepared ahead. For example, a crock-pot of barbecued pulled pork and a platter of sliced rolls allow guests to make an easy sandwich. For the little ones, stick to familiar foods such as graham crackers, saltines, dry cereal (like Cheerios), animal crackers and teething biscuits. 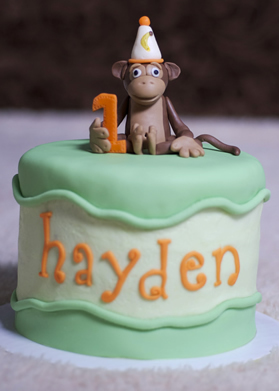 Cake: One of the top trends for first birthday parties is a smash cake – a small cake made especially for the birthday baby to smash. Now you can save your gorgeous cake for the guests and have your messy shot, too! Not only does it make a great photo opportunity, it often turns into a story of its own. Some babies dig right in and eat by the fist-full, some timidly touch the cake and some dissolve into tears from the extra attention. So, embrace it for what it is, and have some fun! 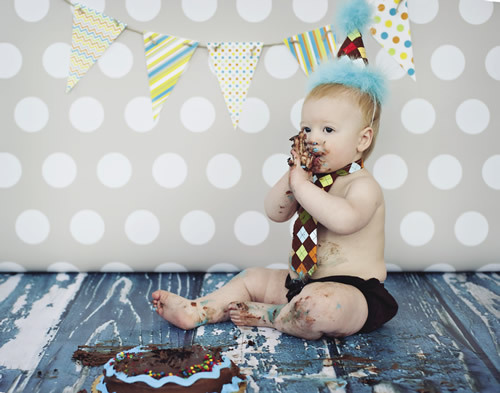 TIP: A cake smash photo shoot is an incredibly fun way to mark your baby's first birthday. A great idea is to get the portraits done before the party so they can be integrated into the party as decorations. Presents: Decide whether you want to open gifts at your child’s party or wait to open them at a later time (to take the pressure off the birthday VIP). If you choose not to open them, then just let guests know through the invitation or as they arrive so they are not anticipating the event. If you choose to open gifts at the party, you will probably be quite busy helping your child. Ask someone to write down the gifts and who gave them so you can write personal thank you cards after the party is over. Activities: While the big day is really all about your baby, having a few fun games parents can play can be a nice way to make your party memorable for everyone in attendance. One idea is the “Baby Photo Guessing Game”: Prior to the party, ask guests to send photos of themselves as babies. On the day of the party, hang a piece of paper below each photo and ask guests to write their name and their guess as to the identity of the baby in each photo. Award a prize to the person with the most correct guesses. Also, plan activities that entertain kids. Sticker crafts, stamping or cookie decorating are great for indoor parties. Piñatas, ball pits (kiddie pools filled with plastic balls), or physical games are great for outdoor parties. Most importantly, relax and enjoy the party. You've worked hard this year and deserve to have fun, too.